> Flavor List | What Percent Flavoring in my E juice ? What flavor percentage in vape juice and what steep times for your e liquid ? Most of the flavors offered on this site are food grade but their use now also applies to the ecigarette. If for any culinary use, a precise dosage is required for each recipe, it is the same for vape. We have therefore gathered here the list of the main flavors available with the dosages and steeping time recommended to create a e liquid easily. A detail will still remain inaccurate despite our indications. This is your own perception and sometimes even the actual state of your taste buds after years of smoking that will require you to modulate dosages over time. A factor that should not be neglected. How to use food flavoring ? Flavors dedicated to electronic cigarette are in fact food flavorings that can be used normally, whether it is incorporated in desserts, to flavor creams or yogurts, to create ice creams or sorbets or simply to make cocktails or simple drinks. Manufacturers advise to add one or two drops to any preparation and then adjust according to the desired rendering. No prior dilution is necessary. The following listing of specific brands and dosage is for vaping. We emphasize that it is dangerous to use food flavorings available in traditional trade, they are not suitable for vaporizing and may contain harmful substances in inhalation. How to use Capella Flavors for e liquid ? Capella flavors require a precise dosage when they are gourmet or associated with a complex recipe. You will find below the list of the flavors available on this site as well as the dosage and steeping time recommended for the best result. Flavor West flavors are often poorly evaluated because the recommended dosages are evasive. Below you will find the optimized dosages and steeping time of all the Flavor West flavorings available in our shop to make your e liquids with complete peace of mind. This evaluation is most often based on the experience of our customers, ours and customer reviews posted on Arom-Team. How to use LorAnn Oils ? LorAnn Oils flavors have a reputation for powerful aromas and many natural flavors. To obtain a balanced eliquid, the dosage must be adjusted precisely. Below you will find the dosages and steeping time of the LorAnn flavors available in our shop. Note that the flavors have been carefully selected by us because LorAnn flavors are primarily food grade. The manufacturer has adapted part of its range for the electronic cigarette, thus ensuring products free of substances potentially irritating or harmful to the respiratory tract. How to use the Flavor Apprentice concentrates ? 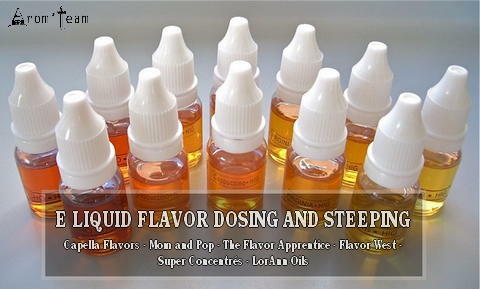 Flavor Apprentice, Perfumer's Apprentice Flavors are well known to electronic cigarette users. Below you will find optimized dosages and steeping time for a successful e liquid. These indications are most often from the diyers themselves. How to use Mom and Pops concentrated flavors ? Mom and Pop aromas are very fine flavors for perfect gourmet e liquids or breathtaking tobacco liquids. But their manufacturer, although friendly, offers a uniform dosage of 20% largely overvalued for a balanced rendering. Below you will find the dosages and steeping time of the Mom and Pop flavors recommended by Arom-Team based on our experience and that of our customers. How to use Super Strength Flavors ? As their name suggests, these tobacco flavors are super concentrated. In fact, their dosage must be strictly respected to avoid producing a disappointing e liquid. We do not indicate steeping time for each because for this range, a rest period of 3 to 4 weeks and more is really necessary for the flavors to develop fully. These super concentrated flavors allow you to make a high quality tobacco e-liquid at a very low cost. They are also very realistic, really approaching the tobacco taste, be it cigarette, cigar or pipe. Some are simple tobacco flavors, others are complex tobacco concentrated flavors, thus offering the simplicity of a gourmet tobacco recipe in a few drops added to a base. How to use Flavour Art Concentrates ? Flavour Art flavorings that we propose on this site are ultra concentrated. A precise dosage is therefore indicated to perceive all their nuances and subtleties. This Italian manufacturer has nothing to prove in terms of quality; Flavourart concentrates are among the most famous in the world of the e-cigarette. How to use Vape Institut Concentrate ? These Vape Institut concentrate flavors are designed by a cook and his fine palate does not betray. They make e-liquids of quality, with harmonious and original tastes. Unlike DIY flavors, the concentrate makes e liquids by simply adding a few drops to a neutral base, the recipe is already created. How to use High End Revolute Concentrate ? Revolute is a french reference in the universe of the vape. Well known for its PG VG bases or its nicotine booster, it also produces flavors and concentrates for eliquid. Under the name High End, Vape or DiY or Revolute, these aromas are always a guarantee of quality. How to use Vampire Vape Concentrate ? Vampire Vape Concentrate Flavors come from an English manufacturer. They are widely acclaimed for their originality and the simplicity of an e-liquid designed in seconds, the time to add a few drops to a neutral base to obtain a complex liquid. How to use T Juice Concentrate ? These british T-Juice concentrate flavors are famous for their originality. They allow to create a liquid in minutes, simply adding the indicated dosage to a nicotine base to obtain an elaborate liquid.